Scorpions belong to the family of ticks, mites, and spiders. As you might guess, they have some characteristics of those other family members. One trait that reminds us of another arachnid comes during the mating process. The female scorpion entices the male, goes through the process of copulation, and after she gets what she wants, gives him the boot. That is the nicest thing that he can expect. If she isn’t feeling charitable, she will kill and eat him. When the mother has her offspring, each hatches in succession and breaks out of the embryonic membrane. The young are called scorpions, and they ride on their mother’s back until they are weaned. The number of scorpions varies greatly from one species to another. Some have more than a hundred little ones at a time, while others may only have two. The average is about eight. Scorpions might stay with the mother for an extended period, but they always remain until they have their first molt. The mother is responsible for regulation of moisture levels in the young ones and their protection. If the father is allowed to live after mating, he still does nothing toward “raising” the offspring. In some instances, scorpions can multiply rapidly, making a small problem a large one in short order. The appearance of many tiny scorpions at one time represents several new litters and quick action to exterminate them is the best course of action. The most common scorpion in Arizona is the bark scorpion, as these scorpions are known to be the most poisonous. They appear to be small and pale, making it hard for them to see. They’re most commonly found in rocky places and are climbers. These types of scorpions are very dangerous and need to be watched out for. As they can cause a lot of harm with one little sting. Do you have scorpions in your home? Are you having issues with a scorpion infestation? Looking for a reliable scorpion control for your home? Contact Varsity Termite and Pest Control today! 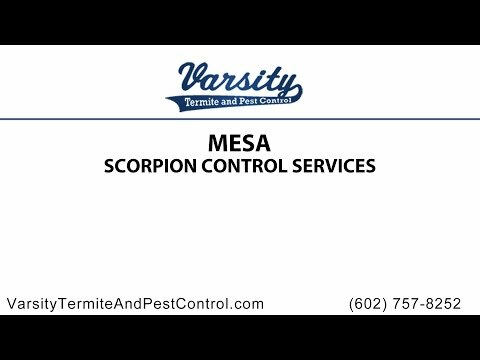 Our many experienced scorpion exterminators in Mesa will be happy to help you in need. If you have any questions or concerns regarding scorpions in your home, our professional team will gladly provide you with all the answers and information you will need. You can also explore our website and blogs for do-it-yourself prevention for scorpions or more information about them. Our other services include termite control and inspections and pest control. So what are you waiting for? Varsity Termite and Pest Control are waiting for your call to keep your home safe and make you be able to feel comfortable living in your home again. Call us today for a scorpion control and they will be out of your home in no time!